The buyer’s journey today looks very different than it did 10 years ago. That’s because 67% of it is now completed digitally. 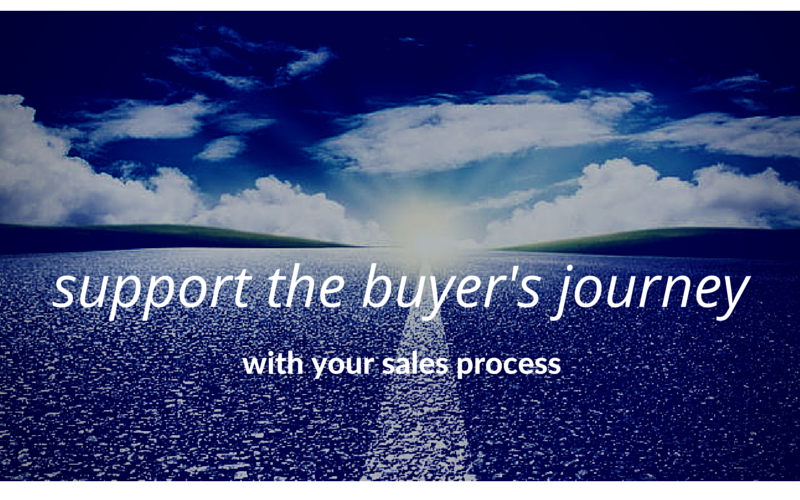 There are three stages of the buyer’s journey—awareness, consideration, and decision. Let’s look at what salespeople can do to support the predominantly digital buyer’s journey by designing a sales process that aligns with each stage. The awareness stage is the first step in the process. During the awareness stage, buyers realize they have a problem and think, “Maybe there is a better way.” Buyers conduct research that is “focused on vendor neutral 3rd party information around identifying symptoms or problems.” They look for reviews and other content that helps them make a more informed buying decision while trying to unearth how others have solved the same problem and how well the solution actually worked. For example, let’s say salespeople are having trouble building a healthy pipeline and the sales manager is struggling to identify the bottlenecks in sales performance. She is aware that her time could be better spent on coaching and strategizing on “real” opportunities, so she develops team best practices for engaging and managing leads throughout the funnel. While the buyers during this stage are not technically ready to speak to Sales, there are still many things sales can do. Maintain a quality list of prospects with valid email addresses and social profiles. Share marketing campaigns and events via email and social media. Use a tracking tool like Hubspot Signals to get notified when prospects are visiting your website and downloading marketing assets. Start adding responses to questions you’re getting from customers, along with industry observations and general advice, to the company blog. Include industry-specific and symptom-related marketing materials to your prospecting messages. When buyers reach the consideration phase, they’ve clearly defined their problem. They are “committed to researching and understanding all of the available approaches/methods to solving their business challenge.” Now they know what the problem is, but they need to know the best products/vendors/solutions to solve it. Using the example above, the sales manager is now learning about CRMs like Salesforce.com, HubSpot, Infusionsoft, Pipeliner, Zoho, and Insightly. She begins to research each solution to see which is going to work best for the sales team. Buyers may be a little hesitant about speaking to a salesperson at this stage, but sales can start opening communication and begin talking about CRM solutions and company differentiators. Establish a follow-up cadence that goes beyond “just checking-in” to ask great discovery questions and develop insightful interactions. Shift content shared to buying guides and case studies. Connect the dots between problems and solutions that will make a measurable impact. Put “a face to the name” by publishing a demo video of you talking about your products and solutions. Lastly—and most importantly—is the decision stage. Buyers are narrowing down their choices to make or recommend a final decision by “researching supporting documentation, data, benchmarks or endorsements.” There are likely multiple stakeholders involved in influencing the final decision. Continuing with our example, by now our sales manager has narrowed down her favorite options to Salesforce, Infusionsoft, and the HubSpot CRM, is conducting in-depth research into the three, and may even reach out to current users to learn more. This is the stage where all the sales activity happens. Buyers are fully engaged with the salesperson to ask detailed questions about product features, implementation, training and support. Maintain direct communication with decision maker(s) and other stakeholders. Shift content shared to testimonials and social proof from similar customers. Leverage insights generated throughout the sales process to craft an Agreement that positions your solution as superior to the competition and inspires confidence in a purchase decision. Always include hard data to support your agreement; this may involve using sales tools such as ROI or Value calculators in your communication. Ultimately, you can empower your sales team by ensuring their actions are aligned with today’s buyer’s journey. By designing a sales process that works side-by-side with this journey, your salespeople will be less frustrated and more successful. To learn more about how to align your sales team with today’s buyer, check out Hubspot’s new Sales Certification program.